The announcement of the final agreements between the government of Colombia and the FARC (Revolutionary Armed Forces of Colombia) is exciting news. The Evangelical Lutheran Church of Colombia (IELCO) and all affiliated organizations and ministries have been working for decades to build peace and look forward to the next stage in this long and arduous journey. What are the perspectives of Lutheran Colombians on the peace agreements and hopes for the future of their country? The plebiscite, where the Colombian people have the opportunity to vote “yes” or “no” on the agreement, will be held this Sunday October 2nd. We have been highlighting the voices of our Colombian Lutheran brothers and sisters and their perspectives on the agreements. Pastor Jairo (middle) with Curtis and Katie. Photo by Zulanlly Chaparro. As a Lutheran Christian, I have a commitment to peace that moves me to become a defender of the peace that comes with social justice for all. The gospel of Jesus calls me, through faith, to be a peacemaker and therefore, by the force of the word of God, a witness to this peace proclaimed and exemplified by the life Jesus. I believe that the negotiation process with the FARC is a unique opportunity to start a new path for my country; a path of hope for the present and for future generations, where one can live in peace. Or, in other words, a country where the rights of its citizens are fully protected as guaranteed by our constitution. I have personally experienced the direct consequences of the violence that has affected millions of Colombians. Living with the anxiety generated by the violence, violence created by all sides, is difficult and it affects the development of the person. When there is no peace, there is no freedom. That is, the fullness of being human, to live and enjoy your own country, your family, even your own body and the most intimate decisions, is limited. Giving approval by voting “yes” to a process that began under the shadow of doubts but has managed to stop the war and its effects, is an ethical and moral imperative that every Christian should understand. Supporting the peace process is the call of the gospel, in the language of St. Paul, to let the Spirit create in us good fruits that oppose the works of the flesh (Gal 5: 16-26). That is why as a Lutheran in Colombia I'm happy to be able support the beginning of a responsible peace-building, giving further testimony of God's work in my life. The crowd cheering right after President Santos and FARC commander "Timochenko" signed the agreements. Photo by Curtis. 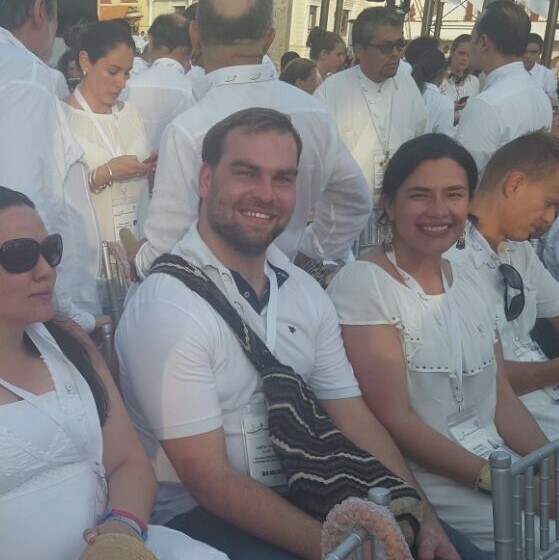 This last Monday, the 26th of September, Sara Lara, the coordinator of the human rights program of IELCO and myself (Curtis) were honored to be invited to attend the historic signing of the peace agreements between the government of Colombia and the FARC (Revolutionary Armed Forces of Colombia) in Cartagena, Colombia. 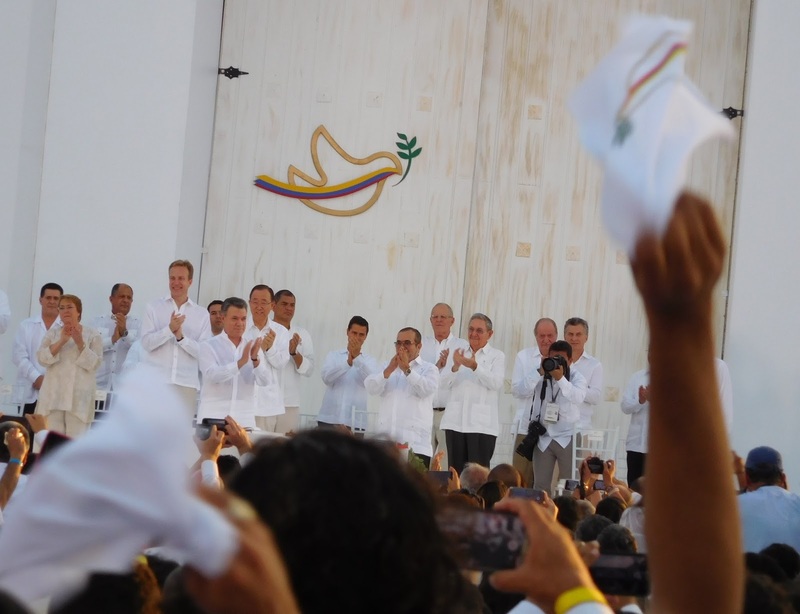 In an atmosphere full of hope and a sea of white shirts and white flags, we were able to enjoy the event, which after four years of negotiations brings an end to more than 50 years of armed conflict. 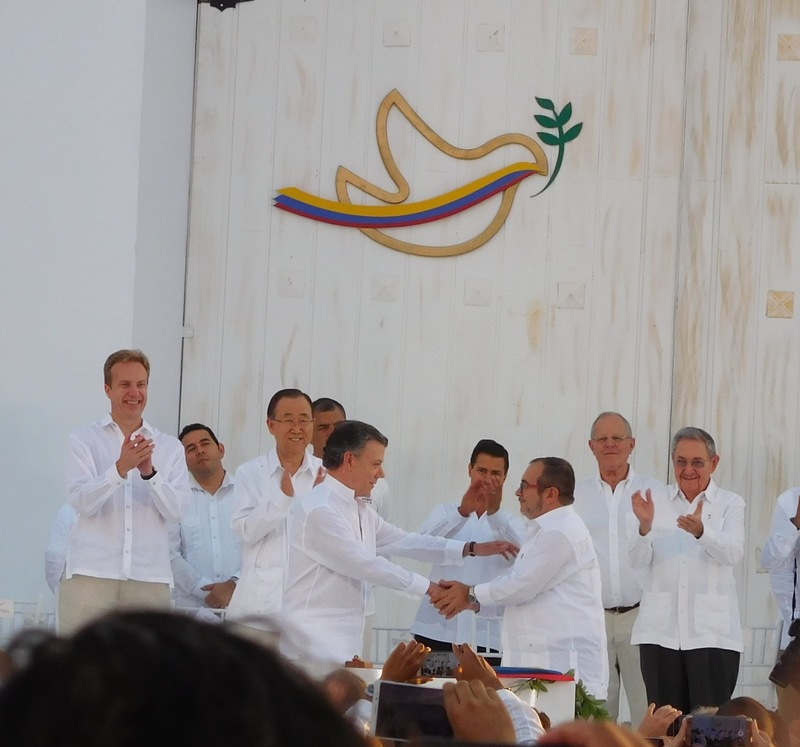 Tears of joy and shouts of “Si se pudo” (It was possible) or “Se vive, se siente, la paz está presente” (It lives, it feels, peace is present) filled the crowd as President Juan Manuel Santos and FARC commander Rodrigo Londoño “Timochenko” signed the 297 page document bringing “a second opportunity on earth” (famous quote from Gabriel Garcia Marquez, Colombia’s most famous author). Here is the communication from DIPAZ (Inter-Church Dialogue for Peace) which IELCO is a member. President Santos and "Timochenko" shaking hands after signing. Photo by Curtis. Curtis with Sara Lara at the signing. Photo by Jenny Neme.